The time arrived. Preston had hit 18 months and I wanted to document it. An appointment was made. We were going to test out Kiddie Kandids. I mean, how wrong could it go? The place has the word "kid" in the title. The morning of, we get up early to get ready. All of us had to get ready just in case I decided, more realistically Preston decided, that we needed to get a picture with all of us in it. Because this place was in the valley we had to get up that much earlier to make sure that we arrived not only on time but just a smidge early. Everything went according to plan. My hair even did it's thing. Something that I definitely wanted proof of in photos. Everything was going great until we got there and it was time to start taking the pictures. This place was NOT kid friendly. Not in the slightest. It started out when they told me to set Preston up on a platform and walk away. For some reason that is unbeknownst to me, they expected Preston to just stand up there and smile. Ummm, hello, he's only 18 months. He was terrified. Preston wanted nothing to do with standing up on this platform for a complete stranger. Can't say I blame him. I didn't even want to stand on this platform and I'm an adult who knew that nothing bad would become of it. 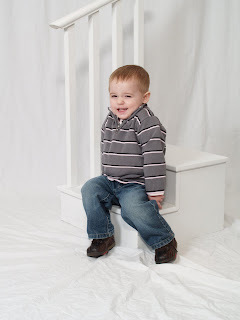 But instead of telling the "photographer" that, I attempted to get Preston to smile for the camera. He was very unwilling to do so at first. But after Brad gave him a ball and they started playing catch he was in a much better mood. The smiles had arrived. The photographer's clicking skills had not. She wouldn't take a single picture. It was this one's too this and that one's too that. Nothing. A half hour later we were all done. Well except the photographer, she was done right after we arrived. Needless to say I didn't order any of the six photos that were taken in the half hour that we were there. And when I was asked if I wanted to reschedule, I answered with "I'll call you." That was a lie, I most certainly will not be making any phone calls for a follow up appointment. Not after the disappointment that followed the first one. Perhaps I was spoiled after his 12 month session? The whole session was great and the pictures even better. I still show them off in our living room. 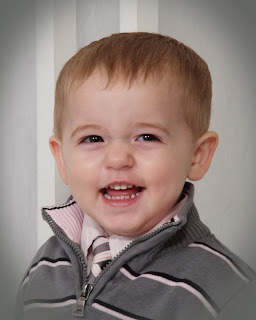 We wanted something simple this time, just one or two of Preston smiling for the camera. In and out in $50. We got in and out in $0. So it was cheaper than I'd planned but not nearly as enjoyable. We left with nothing! And on a good hair day. 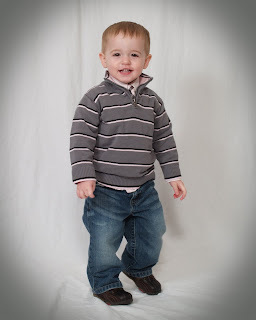 Since I'd already bought his outfit and I really wanted 18 month photos we were going to give it one more shot. 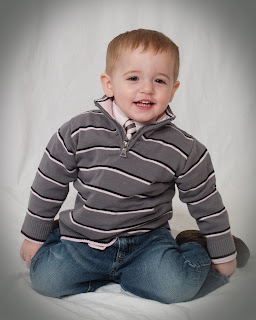 Hopefully Preston would be willing to cooperate and we'd leave with something worth hanging on the wall, at least until his 2 year pictures.. And was it too much to hope that I'd get another good hair day? Attempt number two would be held at Sears. 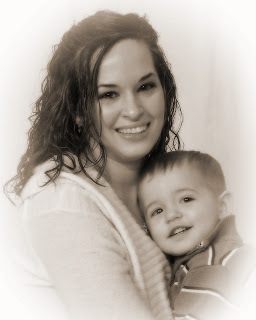 A friend of mine from my Mommy group had just had her kids pictures taken there and they'd turned out great. I was excited. Preston looked adorable and my hair was cooperating. I even brought my Mom along this time for support, since Brad was working. We succeeded! Preston was in a great mood, the photographer was very kid friendly, and we left with more than just the one or two shots that I'd been hoping for. 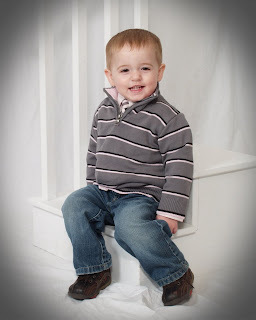 What can I say, I'm a sucker for cute pictures of my son. I'm a sucker for any pictures of my son. So without further a'do, here are some of my favorites. Does bringing your Mom along mean you've made up? Aren't kid pics fun??!!! LOL So sorry about that other place, does not sound like a good place to have 'kid' in the title. The Sears' photos turned out great though! He is adorable! !